Ah, peaches. From their golden and rosy hues to their sweet fragrance and juicy flesh, there are few fruits more summery. We’re rolling in plump peaches here at the moment, farmers market trestles groaning under the weight of them. 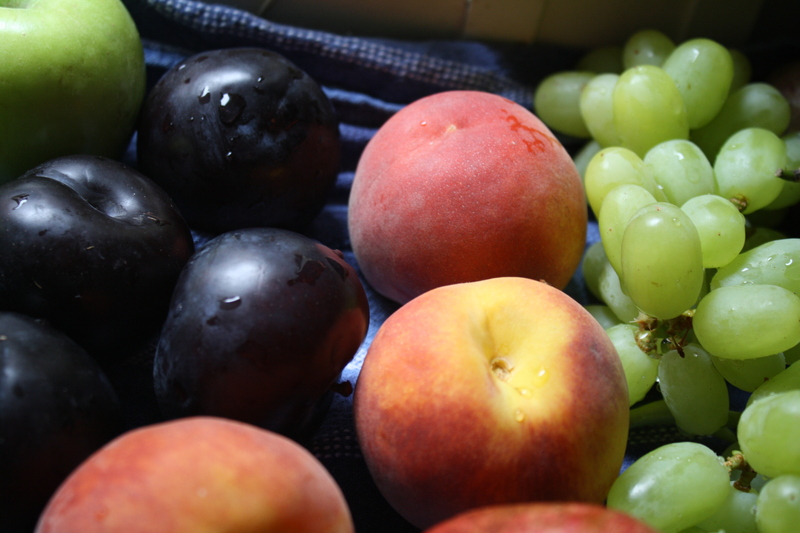 Yellow flesh peaches, white flesh peaches, and their bald cousins, nectarines. And they’re so versatile! Slice them into a salad, bundle them into a pie or tart; poach or roast a couple and dollop with cream; dice one onto your morning muesli or hook in then and there at the market, juice dribbling down your arm. 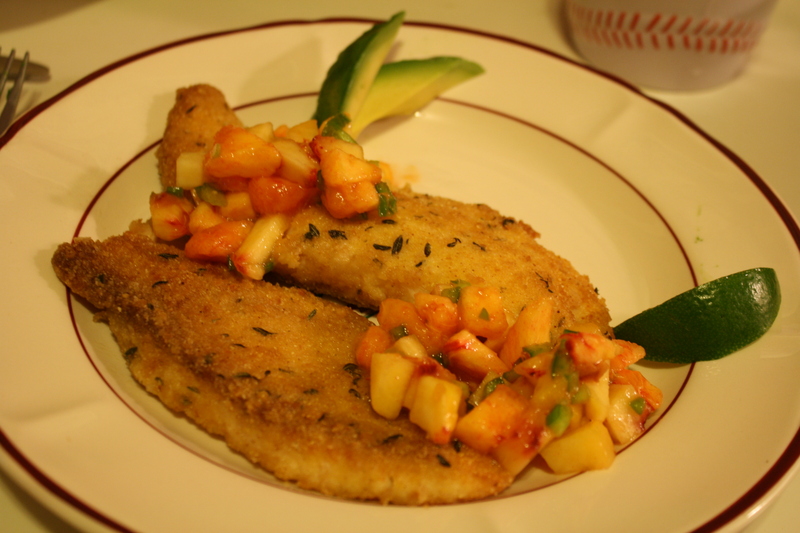 As soon as I saw this recipe for chicken with a peach and jalapeno salsa, I knew I had to try it. It sounded like an interesting novelty, but when we finally concocted it last night I was blown away by how bloody delicious it was. I used the same breading but fried fish fillets (tilapia) instead of the chicken breasts in the original recipe; I also substituted sesame oil rather than peanut oil. The fish was flaky, perfectly cooked, in a golden crumb that begged to be devoured. The trace of thyme in the breading made a surprisingly great complement to the peaches, which carried a hint of heat and bite from the jalapenos (but could have used even more chilli). Accidentally, we had a mix of borderline-overripe pink peach, bruised to softness by the rough ride home from the market in my bike basket, and a firmer yellow one from the shop that day. The colour and texture mix was so good I suppose I’ll have to take a peach around a bumpy block on my bike basket next time I try to recreate this! We served it with some sliced avocado and a green salad but really, it didn’t need much else. Looking forward to making this salsa again, perhaps as part of a fish taco or with a lovely pork chop. Peel, stone (ha!) and dice the peach flesh fairly small, say 1-2cm cubes. Seed and finely mince up the jalapeno, and combine with the peaches, lime juice and sugar. Start with one jalapeno and add more to taste. Meanwhile combine the flour, breadcrumbs, corn meal, salt, thyme and cayenne and spread it out on a plate. Rinse the fish fillets in cool water, shake off excess liquid, and gently press them damp fish in the crumb mixture so you get as much sticking to it as possible. Heat four tablespoons of the oil in a large heavy frypan or skillet, and fry the fillets over a medium-high heat. Give them about five minutes (or until golden) and gently turn over for another five minutes, adding another spoonful or two of oil. That should be plenty of time to cook the fish – if your fillets are really thin cook for less time. Rest for a moment in paper towels to soak up excess oil before serving the fish with the salsa.